Now, as in the past, scientific journals devoted to a particular specialty are useful assets allowing one to keep abreast of current discoveries and developments concerning new technologies and equipment. As time goes by, a journal can also serve as source of information on the history of the science and its associated technology. A good example of this is The Journal of the Royal Microscopical Society. Early volumes of this journal contain a wealth of information, much of which is not easily available elsewhere, that is useful to collectors and historians of the microscope. 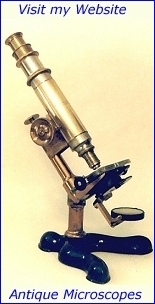 Many of the microscopes and accessories that where introduced during the years covered by the journal are described most of these descriptions are accompanied by illustrations. Some years ago, after trying to locate information about a particular microscope, I consulted this journal and found that I had to search for the microscope by checking a separate table of contents that accompanies each volume. While I finally found what I was looking for, it occurred to me that a cumulative index of for all the volumes would be useful. The result is the indexes presented on this site. The index starts with the first volume of the journal which was issued in 1878. I decided to limit the index to 1907 (this is about the time that my own collecting interest ends). I limited the index to cover equipment and excluded the numerous articles covering the science of microscopy. I tried to index all the microscopes described in the years covered. The accessories were usually indexed only if the journal also included an illustration. There are surely some errors and omissions I apologize for these in advance. Obviously, this index will be of most value to those of you who have access to the journal. Recently Google books made the various volumes of the Journal available online. You can use the index to find the item you are looking for and then use the link to the appropriate volume where you can enter the desired page number to retrieve the information. If we can assume that the articles in the journal were published in a timely manner, then the date of the article would correspond to the date that a new piece of equipment was introduced. Two versions of the indexes are provided in the links above. The first is sorted on the maker's name and the second is sorted by the apparatus described. Use the find command in your browser to locate what you are looking for.